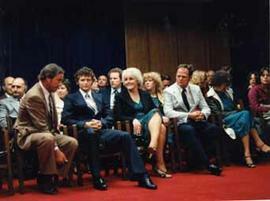 Photograph of Premier William Bennett, fron left, seated facing Terry Fox and his parents; Fox ran across Canada for cancer research andlated succumbed to the disease. Photograph of executive council members at table including W.A.C. Bennett and Lyle Wicks. Photograph of executive council at table including W.A.C. Bennett and Lyle Wicks. Photograph of executive council of 1955 at table, including W.A.C. Bennett and Lyle Wicks, prior to election of 1956. Photograph of Frank MacKenzie Ross shaking hands with W.A.C. Bennett on front steps of legislature building with Royal Canadian Sea Cadets standing guard.